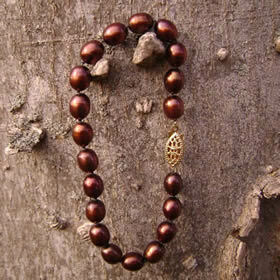 This luscious creamy chocolate rice pearl bracelet has a beautiful luster and is 7mm in size. This bracelet is hand knotted on the finest silk thread and the clasp is a 14kt gold filled. This classic style fishhook clasp has a U-shaped hook for added security. This style is typically used on pearl strands and other fine jewelry pieces. This beautiful bracelet can be worn for daytime or evening wear. For a different clasp or special sizing just for you, please call me for you custom order pricing. This beautiful summer bracelet comes in three colors of potato pearls. The colors are green, cream and pink and are are 6mm in size. This bracelet is hand knotted and the stunning sterling silver rose quartz cabachon clasp with the safety catch makes this bracelet so feminine and eye catching. The combination of these three pearl colors allows you to wear this bracelet with all your fashion accessories. This bracelet can be worn all year round with your fashion accessories. For your own custom designed size please call me for pricing. This white freshwater pearl bracelet is made from rice pearls that are 6mm. Hand knotted & finished off with a beautiful sterling silver hematite cabachon clasp. The clasp comes with a safety latch for extra security. The top drilled pearls have a beautiful shape and an unusual look. 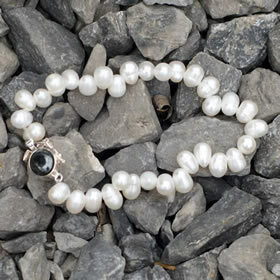 The contrast of the black clasp and the white pearls gives this bracelet a classic look that will last forever. This bracelet can be custom made to any length you desire. Please call me to place your custom order. This colorful bracelet is designed with 6mm freshwater rice pearls with 4mm sterling silver spacers in between each pearl. The hematite clasp is an 8x10mm sterling silver cabachon design with a safety clasp for that extra security. 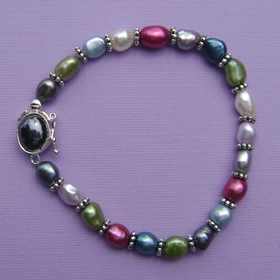 The pearl colors include green, raspberry, lilac, blue, grey and white.This bracelet is hand knotted on silk thread. 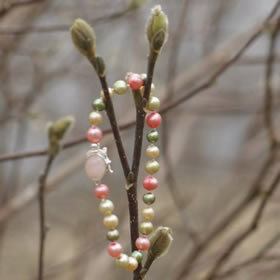 These pearls have great color and have a wonderful luster. This bracelet can be ordered in your special size. See our Bracelet Length Guide.